This is one of my favorite moving cards. FLIP FLOP FOLD /SWING FOLD video is from SplitCoast Stampers and they will both give you all the directions as well as a video to see how its made. 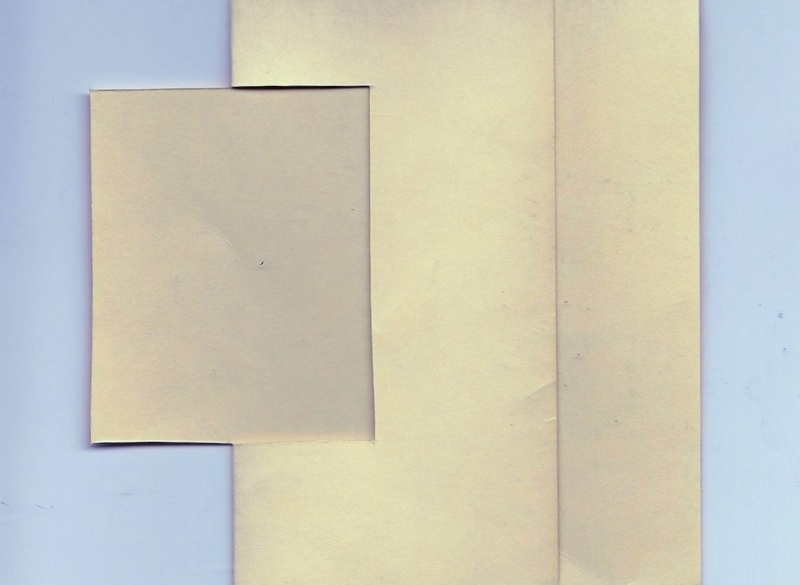 Now my HINT is that I have told you before is so you don’t have to revisit the sight or look up the pattern every time… I used an old file folder and cut a template of the complete card ..on it I wrote where the score marks were on my Scor-Pal then I cut out the swing /flip flop part . I just lay this on the precut to size card and then trace lightly around the flip part so that I know to cut it then reverse and flip the other side up and trace lightly around it so that I know where to cut it… score the verticals and viola your done. So then I also cut /scored several different colors of card stock so that it would be ready to go when I am in a hurry…to cut them I cut the basic card and scored then I flipped the card overh and traced around the flip/swing reversed and traced around it on the other side I now have 3 lines to cut on and for me this is a little easier then reading over the pattern each time… I still keep the directions as well as the template in a sheet protector along with the extra copies that I precut and scored for quick access. The side panels on this card lend themselves to punches… you can use the ek success candle punch or any of the other border punches along the side or you can punch out hearts and then glue a red strip on the back side so the hearts show read or you punch out stars and do the same or punch the stars and hearts out of colored paper and glue or tape them onto the side panels. Another great punch or stamp is a balloon one… you can also make the stars and hearts look like a ballon just by drawing a string . There are just so many different ways you can use this card. And I love when I make a mistake … I am sharing this with you so you don’t do it…you can see that I didn’t slide my stampings over close enough to the fold line so that they don’t show when the card is closed….DUH….I know this I have made hundreds of these but when in a hurry your mind sometimes goes on auto pilot which as you can see isn’t always good. LOL… Its not so bad that I would throw the card away but I do have some friends that would probably “do over” and save this as a sample. 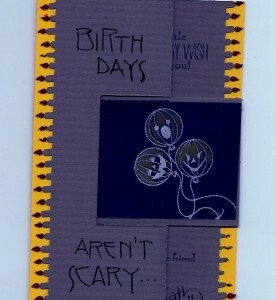 Another way is to use photos if this is a dear friend or family member you may have photos of previous birthday or even their first birthday great image for on the front and lots of fun /personal things you can say for the flip side. As you can see from my sample I like to repurpose my images…this front one is obviously halloween balloons but I have loved and found that using the saying (birthday’s aren’t or don’t have to be scary) works great with this image…then depending on their age and how sensitive they are I like to use the candles and tell them its the candles that are scary..
A bird on the front with a little birdie told it was your birthday(stamp inkadinkado)or Happy Bird-day to you …along with a bird punch or a photo of a bird or a stamp of a bird image..with the inside saying So I ate him and glue a tiny feather ( from any craftstore or even walmart in the fishing/fly making area) on the inside. 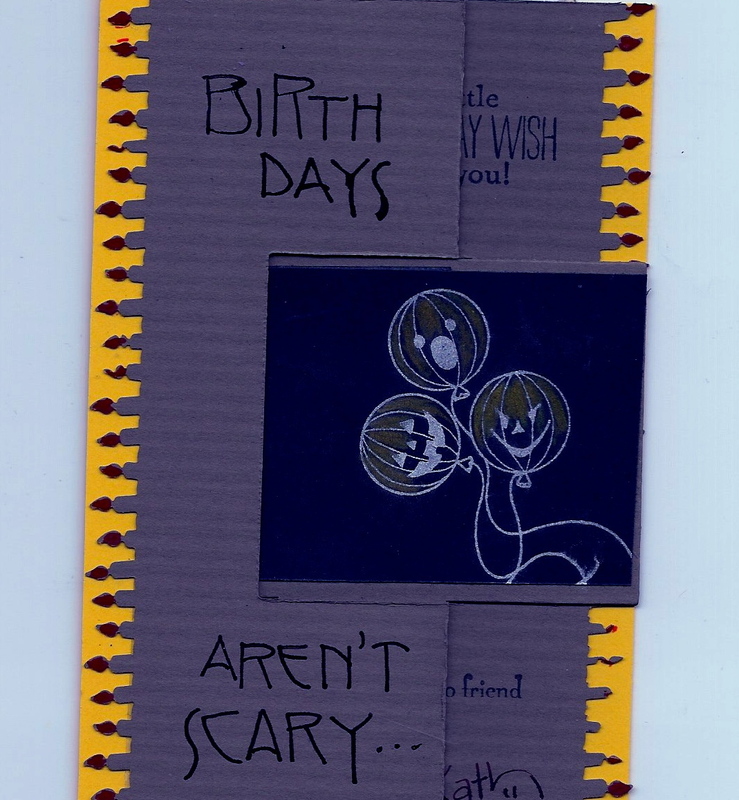 Now these ideas are my quirky side… I don’t tend to do lovely , elegant cards…I tend more toward the funky side ..so just let you mind go and look at what you have and go from there. These are some of the images I mentioned. A little birdie told me it was your Birthday frequently at JoAnn’s or go to Inkadinkado web site. Happy Birdie to you … a muse rubber stamps on line I think. 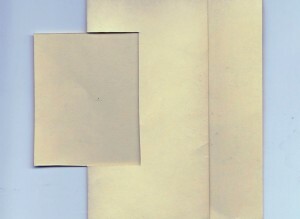 Some other ways to decorate this card are to make it run vertical as that my fit you image or photo better either way it just pulls open and flips all by itself. Again this is a great cut it ahead and score and cut the flip part ahead and store it in a sheet protector with the directions if your need them. That way when you need a special card you just pick the color you like and away you go. WHILE I love the SCS er’s web site and their directions are great when you print them out depending on where you print out all the art work they show you can have 6 or even 8 pages…. so here is my hint… I print in fast color ( the color really helps sometimes) and then because they print on only one side of the page…I save the first sheet whole but I cut the additional pages down to strips which I loosely tape not the front and back of the first sheet in order . This way I can usually get only a single or double sided print of the directions then I stick that one in my sheet protector so that I can look at it easily not be fumbling with 6-8 sheets of paper …You don’t have to do it like that just a hint. I think I may have told back a few blogs that I was going to Washington DC with a couple of friends to see my honorable mention envelope from 2011. Its on display there for a while yet so we are going to see that and also some of the other sites around DC. So I wrote this blog early so I could just post it on time as I won’t be here. I also wanted to share with you some other web sites that my friend and Calligraphy buddy LINDA O’NEILL from Sequim WA and previous CA shared with me. Linda is the current president of the Peninsula Scribes in Sequim and she is keeping them on their toes. The group continues to grow and I go to activities when I am available . So here are a few of the most recent websites she sent. THE BLOOMING QUILL ..Amy Johnson and her work as wedding etc designer,most of her work is done in one of three styles of pointed pen.. very elegant and lovely to see. Now lastly, I know some of you have trouble lettering or just don’t like your lettering ( you are probably too hard on yourself) or you may be like me and sometimes the card may not need to have calligraphy or maybe the person receiving wouldn’t appreciate it or you just plane DON’T HAVE TIME … there are a lot of fonts out there…lots are free but P22 has a lot of them that are very calligraphic and while they are not free they may be worth the funds for you if you really like them. If you ever do flyers etc for others or for layout and design ideas they you may appreciate this site. I sign up and get flyers about once a month of fonts that are on sale and the sale prices are good and frankly I know how hard the person who designed this font worked and feel he should be paid so every once in while I spring for it. In any case enjoy . Make some cards and PLAY if you think you can’t do this stuff its probably because you have never given yourself permission to play…we aren’t necessarily born with this some do have better eye hand coordination and therefore it comes easier to them but the more you allow yourself and take the time away from cleaning, dog walking, babysitting your kids, etc and give yourself time you’ll find that some of it appeals to you and some doesn’t …I have a friend that can spend hours coloring..not me.. so take what makes you go AHHHH and go forward give yourself time to get the hang of it… did you do an excellent job on the first shirt you ironed, or the first pie you baked or even the first diaper you changed or first bath you gave…its all a learning process and we are always our worst critic...remember BREATHE………. AND then PLAY….if it seems like work move on and find the play.